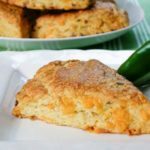 A recipe for scones made with cheddar cheese, fresh jalapenos, and bacon. A savory scone to enjoy any time of the day. Preheat oven to 400 degrees F. Grease a baking sheet or line it with parchment or a silpat. In a small skillet, over medium-high heat, brown the bacon until crispy. Remove the bacon from the skillet and drain on paper towels. Lower the heat to medium-low. Add the diced jalapenos to the skillet and saute until soft, about 2 minutes. Use a slotted spoon to remove the jalapenos from the pan and drain on paper towels. Chop the bacon into small pieces. In a small bowl, add the Cheddar cheese, bacon, jalapenos, and 1 tablespoon of the flour. Stir to coat ingredients with the flour. In a large bowl, whisk together the remaining flour, baking powder, and salt. Cut in the butter with a fork or pastry blender until the butter is pea-sized. Lightly whip eggs and cream and add it to the flour/butter mixture. Using a wooden spoon, stir mixture until it comes together. Add the cheese, bacon, and jalapeno mixture and stir until incorporated. Turn out the dough onto a well-floured surface and knead gently a few times. Pat the dough out to a round that is 3/4 to 1-inch thick. Cut into 8 triangles. Transfer the triangles to the baking sheet. Brush tops of each with egg wash. Bake for 25 minutes or until golden brown.